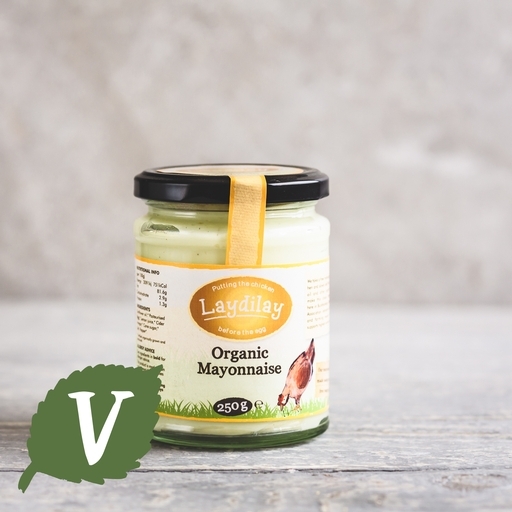 Laydilay organic mayonnaise, made just down the road from our Devon farm. Mandy Johnson uses her own flavoursome organic free-range hens’ eggs, and make every small batch by hand. Rich, creamy, and free of any additives or preservatives – it’s the next best thing to making your own. Mandy's kitchen handles a wide variety of foods and so our products may not be suitable for people with severe food allergies. Sunflower oil, pasturised egg, lemon juice, cider vinegar, cane sugar, salt*, pepper.